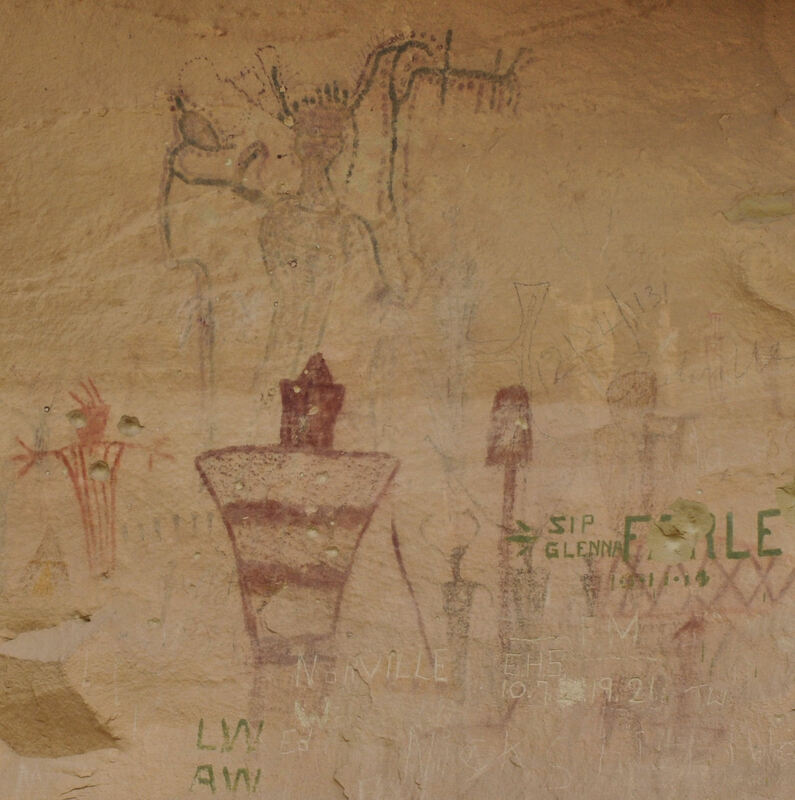 One of the main panels of art in Sego Canyon. To assist in perspective so you can guess the size, look for the fence in the shrubbery. 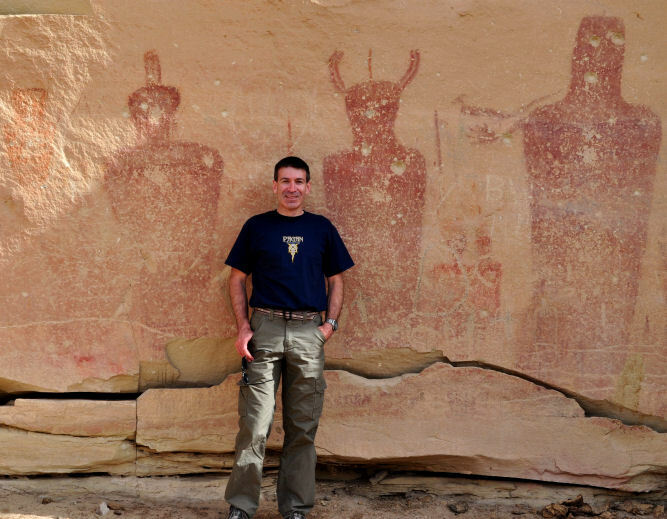 Barrier Canyon style, can be as old as 2000 BCE. This is a close-up of the rock wall shown above. 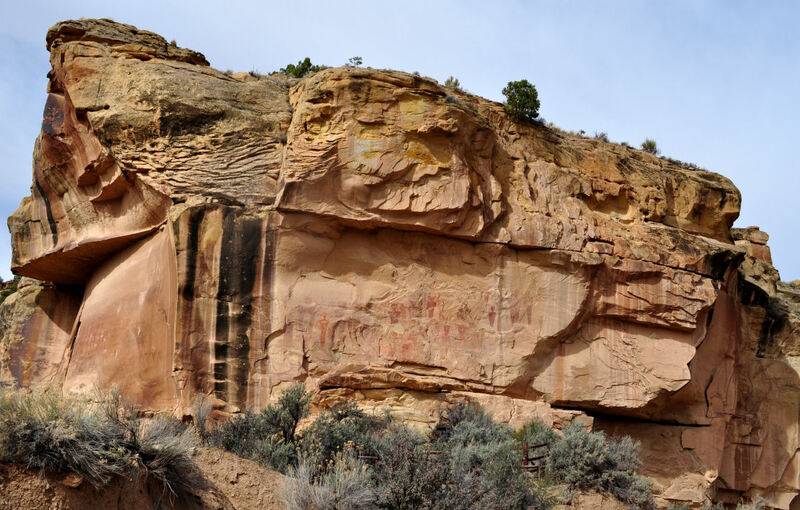 First thing in the morning, we backtracked to Sego Canyon in order to view some ancient indigenous rock art (a special trip for the anthropologist in the group…). 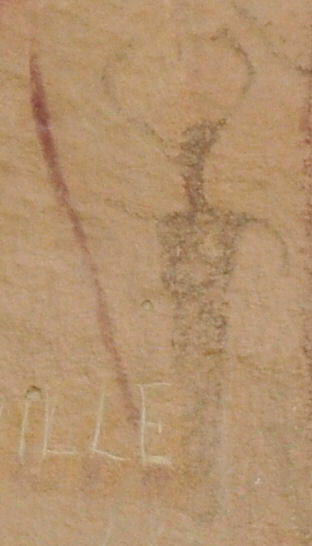 We saw captivating anthropomorphic images in reds, blacks, and whites on the walls of the canyon in several locations. Signs posted explained that the rock art we saw included that from multiple peoples in multiple periods. 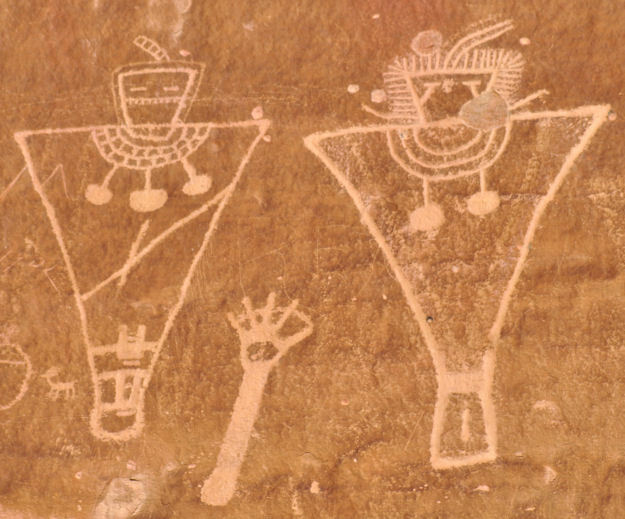 Some of the work was 4000 years old, the newest stuff was only a few hundred years old, by Ute Indians. 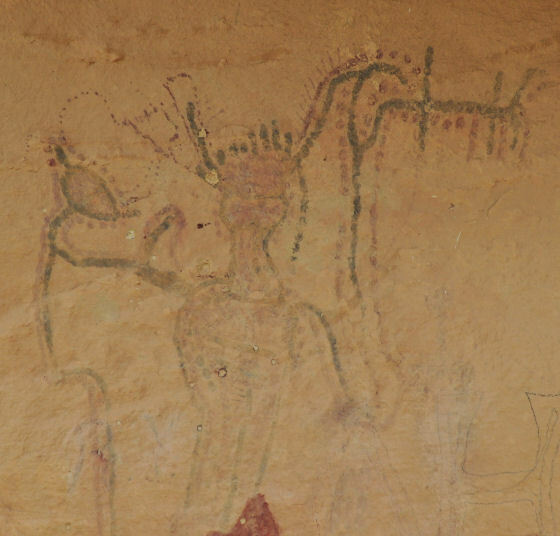 As Tara noted, interestingly, the more complicated and apparently more skilled artwork, was some of the very oldest, at about 2000 years BCE. 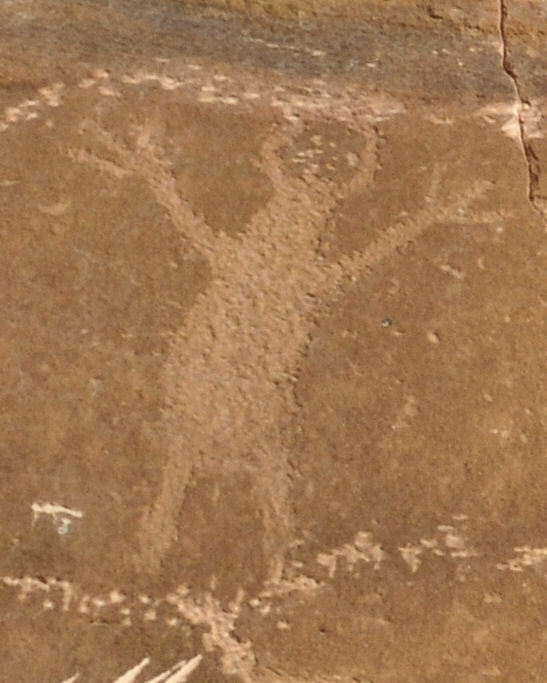 From the Fremont Indians, approximately 600 CE. 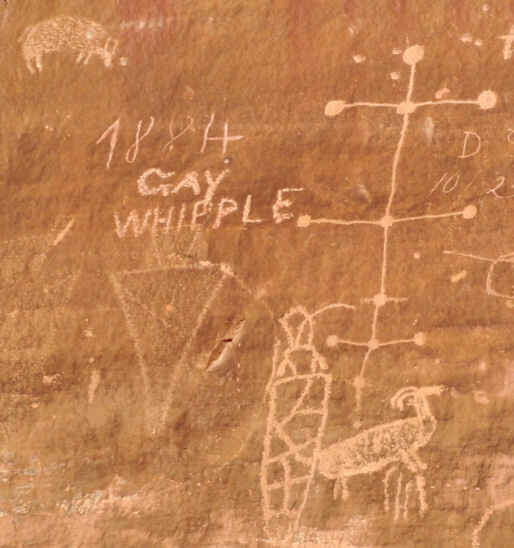 Almost old enough to become artwork itself was the modern vandalism, where cowboys and miners had scratched their names and dates into the rock. Strange and sad, the newest vandals carved their work right over the top of everything else, in the same way that each group of people had done. 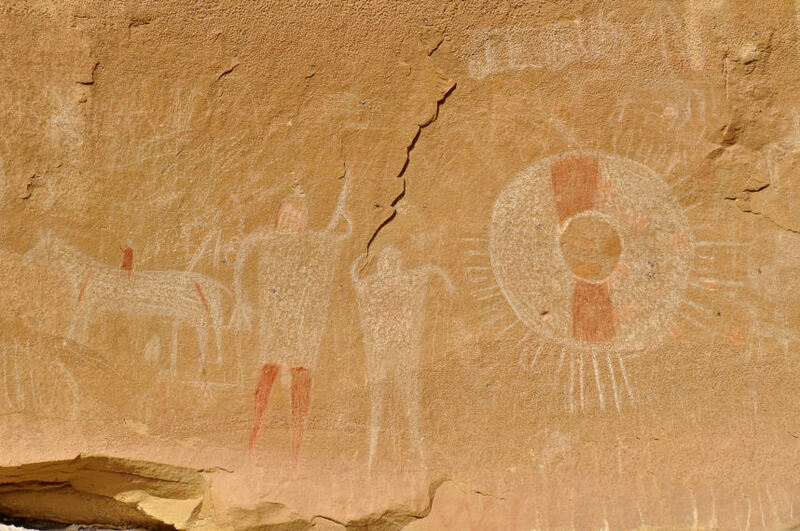 Something struck our cowboys in the same exact way that it had struck the Utes and the Anasazi. 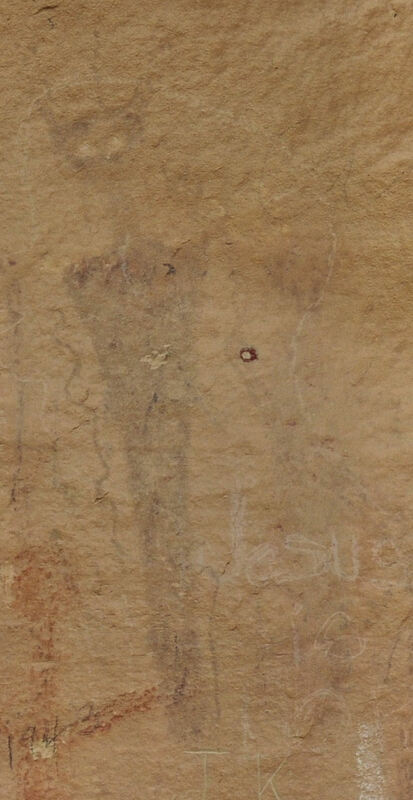 They were all compelled to make their mark precisely on top of the previous artists’ work. 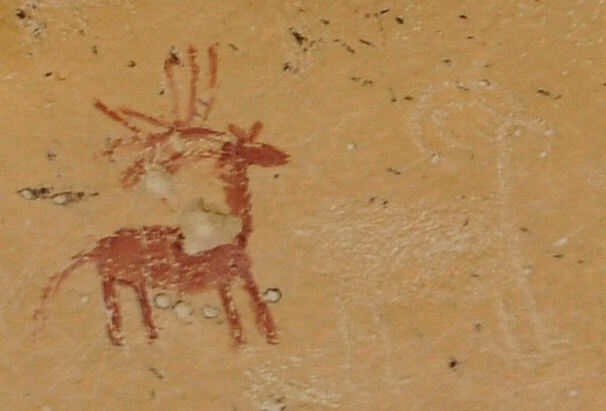 From the Ute Indians, approximately 1300 CE. These images are captivating, are they not? 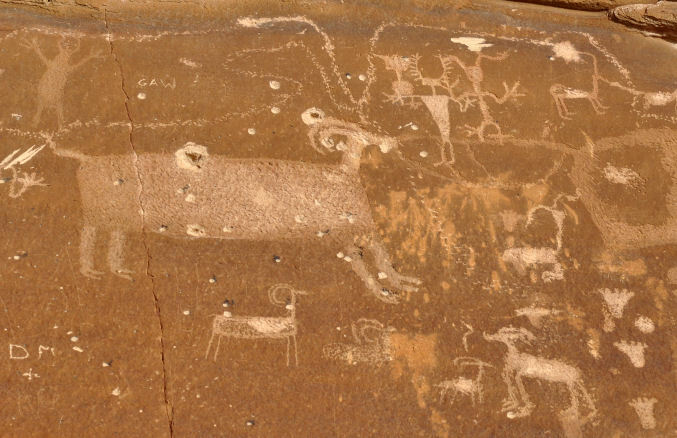 Hunting figures with spears, mountain sheep, bear paw prints, shields, and geometric shapes. But What. Are. Those. Things? The bigger-than-life anthropomorphic alien beasts? God-like, imposing, fantastical, and scary. What are they/ what do they do/ what does it mean? It was humbling to stand there. I wanted to understand. Perhaps if I had held very still and was very quiet, and waited a very long time, it would have all made sense. We were by this time calling it “The Vacation Without Miguel,” who was suffering from one of the worst virus attacks I’ve ever seen. He became ill the day before the trip began, and just seemed to get sicker each day. On top of that, he’s going through a case of being 15 years old and even when he seemed a little better, he refused to participate. Poor kid. 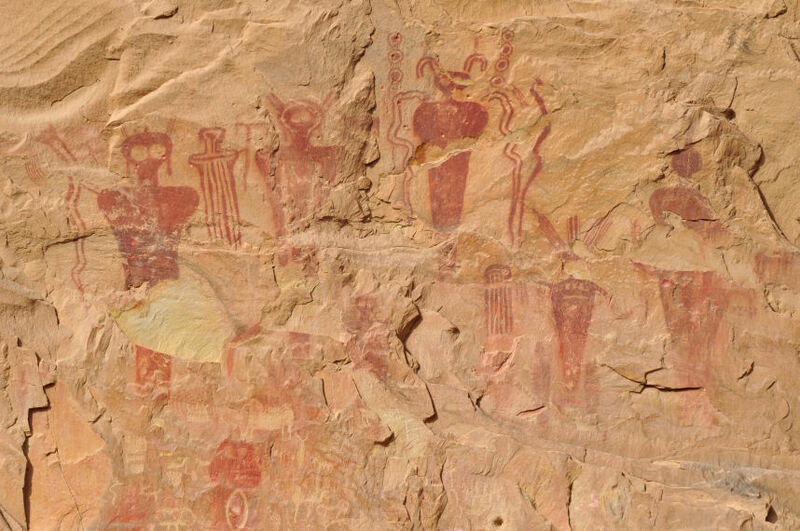 While he rested in the truck, we wandered around, from cliff wall to cliff wall, discovering more art. Since there were no maps or clear guides, we wandered quite a bit, not wanting to miss anything. Mid morning, it was time to return to the highway and began our long trek home. We surged through traffic and civilization once more, and our peaceful week in the desert was no preparation for the madness of the Interstate through the Salt Lake City corridor. Tara and I were delighted once more with the crazy billboards. Salt Lake City has the most insane billboards. We began writing them down. This is what hides underneath my bed! At least one of them totally freaked me out, though I had no idea what it meant. There was a lovely, clean, nicely coiffured 30-something couple wearing pastels and earth tones. They were hugging lightly and looking at the viewer. The caption: “Tired of being normal?” At the bottom right corner, it said “Bioengineering.” Holy cow! 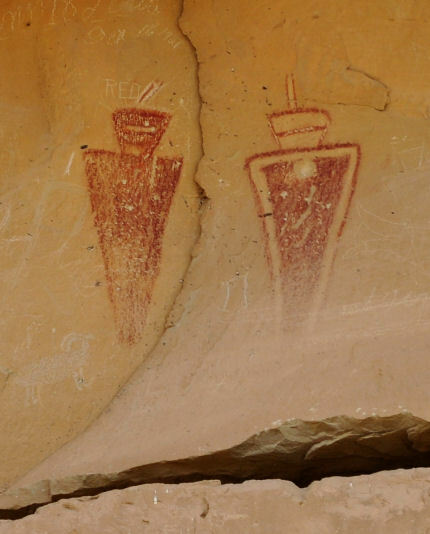 That’s creepier than the pictographs. By evening we had reached Burley, Idaho and stayed there for the night (an actual bed!). Saturday we made it all the way home by mid afternoon and had plenty of time to begin laundry and to adjust our brains back to being-at-home mode.